Game Information: Finn and Swirly Spin is a NetEnt powered game that takes its inspiration from the ever popular Aloha! Cluster Pays. This is a classic five reel online pokie that has done wonders in offering something different to shake up your gaming experience. Quite a few games have introduced the cluster pay mechanic that is prevalent here, allowing players to earn rewards when groups of symbols land anywhere on the screen, triggering some incredible wins. Finn and Swirly Spin is one of NetEnt’s most recent games to implement the cluster mechanic, and it really works with what the game has to offer. 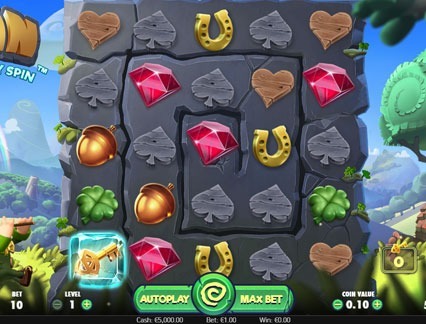 It features a classic theme and some cute icons on the reels, although this basic design does not mean this is not a red-hot game with some great winning opportunities. The swirling pattern on the reels allows players to enjoy some of that classic casino game anticipation, and every cascading match gets you closer to unlocking that rewarding free spins round. 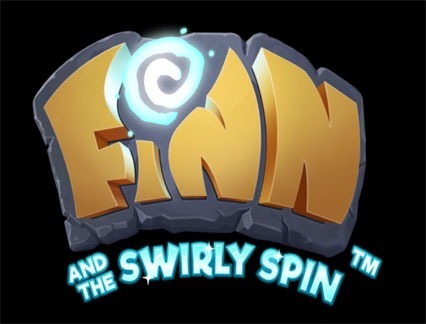 Take a trip to the Emerald Isle with Finn and Swirly Spin, an exciting NetEnt game that takes your spinning experience to the next level. The main character is a leprechaun who spins the reels in a unique way. This game plays out on a 5×5 grid, although the way the reels swirl is what really makes the game different from the rest. Once the reels have stopped spinning, wins are earned by forming matching lines or 3 or more symbols in a horizonal or vertical direction. Every symbol involved in the win will then disappear for the chance to win even more rewards. There are 6 symbols that are present on the reels, which makes wins a little easier. These symbols include a red gem, a horseshoe, a four-leaf clover, an acorn and heart and spade icons carved from wood. The wild symbol is represented by a gold star and if it helps create a win, it will explode and remove any adjacent symbols on the reels. Finn and Swirly Spin has some random features which helps in boosting the player’s bankroll and gaming experience. These random features are awarded randomly during gameplay and make an appearance in the free spins bonus. Finn and Swirly Spin features a traditional Irish theme, complete with bright colours, Irish tunes and comical characters. The main character is Finn, who you will see playing some music with the rolling hills of Ireland as a backdrop. The entire game offers a cartoonish look and feel, which is great and adds some fun and excitement to the game, while a friendly and enticing atmosphere add some extra charm. Overall, Finn and Swirly Spin is a top-class game, and despite rather animated graphics and sound effects, it has a lot going for it – enough to appeal to the most experienced and discerning player. Finn and Swirly Spin is not a progressive jackpot pokie, but that does not mean you can’t earn some major wins. This game certainly offers something new and refreshing to players as it combines exciting gameplay, cascading symbols and plenty of winning opportunities. Thanks to the lucrative free spins round, players can enjoy a possible jackpot of 500x and with an RTP of 96.6%, there is a good chance of players claiming that reward.